3 Competent washing of new jeans - what should be remembered? 4 How to dry jeans after washing? 5 What if jeans are out of shape and size? Jeans - a piece of clothing that is in the wardrobe of every modern person. Some people love jeans so much that they sometimes forget that there are other things in the closet. 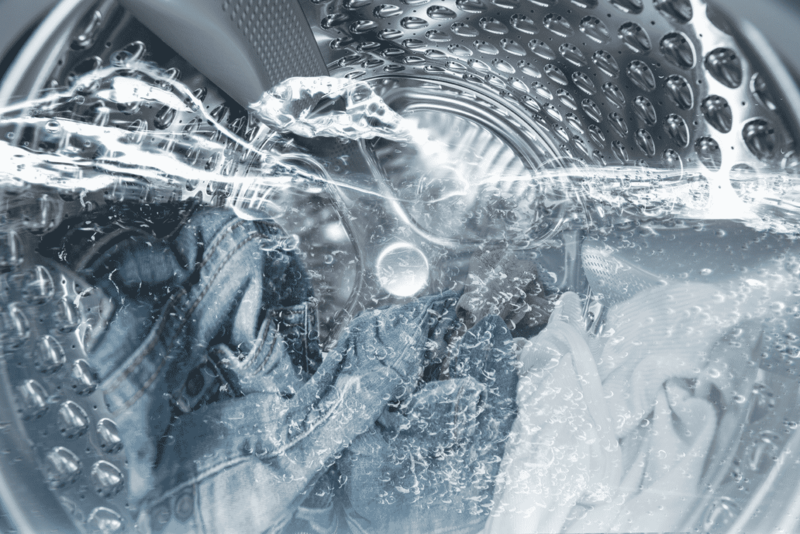 Unfortunately, not many people know whether it is possible to wash jeans, including in a washing machine, and even if they know, do not understand, when what temperature to wash jeans and what other rules should be followed with this. Washing jeans has its own specifics, and it must always be taken into account in order not to spoil your favorite things. This guide will help you quickly understand what you can wash your jeans with and how to do it properly. Before you wash your jeans with your hands, you must soak them for at least one hour. Water for soaking should be warm and with the content of high-quality soap. Soaking and washing jeans in laundry detergent is not as good as with soap, but if you do decide to use powder, be sure to dissolve it with plenty of water. 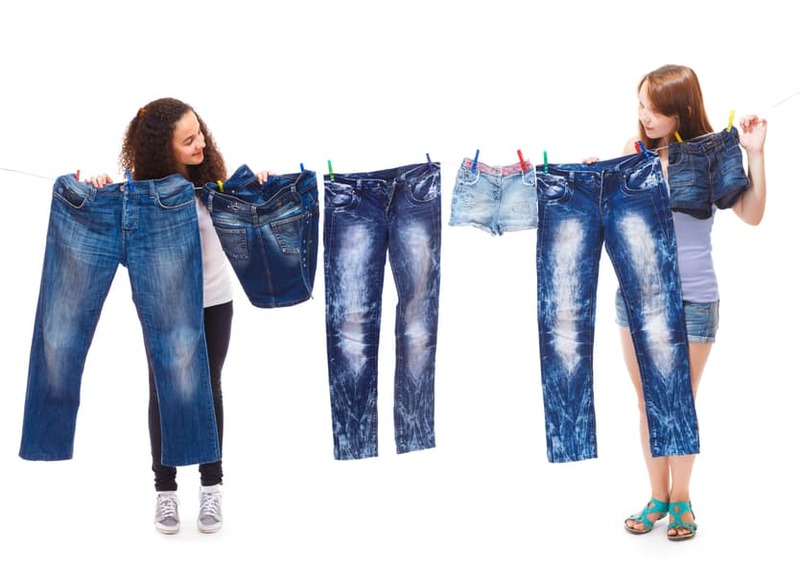 Remember - pouring detergent directly onto the surface of jeans can not, because they can deteriorate. At what temperature do you need to wash your jeans by hand? Heat water to 30-40 degrees Celsius. Washing jeans should be carried out in the straightened form, so for this purpose it is recommended not to take a wash, but to use a bath - in it you can straighten your pants to the full length, which is what you need. Clean jeans should be a soft clothes brush, and soap should not soap the brush itself, and the fabric. Washing black jeans, like blue ones, by hand, is a simple procedure. If you are afraid that your favorite things will sit down during the wash, try a method that was tested in the USSR. It consists of washing the jeans on yourself - you should put on your pants, drench with cold water and clean with a soft brush and soap, then wear wet clothes on yourself until it is completely dry. Before you wash black jeans in this way, make sure that you have good immunity, and the temperature in the room is comfortable so as not to get sick. Before you wash your jeans in a typewriter machine, fasten all the zippers, buttons and buttons on your clothes so that they do not hang out and not come off during the washing process. Also turn the jeans on the wrong side - this rule is especially important to observe if there are rhinestones and embroidery on the clothes. For safety, you can put your pants in a bag before washing jeans in a typewriter. Pour into the compartment a soft detergent intended for colored fabrics. In no case do not add bleach or powders that have bleach in its composition - at the exit you will get heavily faded jeans that are difficult to wear, except for housework. Now we need to choose the right mode for washing jeans. What mode to wash jeans? Despite the fact that denim itself is very dense and durable, to wash it, you need to select only the mode of washing delicate fabrics. If there is a manual mode, you can select it. In some models of washing machines there is a mode for washing denim products. Choose a temperature. What temperature to wash jeans so that they do not sit down after washing? As in the case of hand washing, it is desirable to choose a value from 30 to 40-45 degrees, but not more. Wash with a minimum spin speed. After such a spin, the thing must be well straightened in all directions with his hands so that the jeans do not lose their shape and attractive appearance. Wash without spinning. If you didn’t squeeze the jeans, after washing, hang them vertically, then stretch the legs slightly from top to bottom to squeeze out all the remaining water from the fabric of your clothes. Now you know at what temperature you can wash your jeans and in which mode you wash your jeans correctly. Competent washing of new jeans - what should be remembered? Wash new jeans in cold water or in room temperature water - no higher than 30 degrees. What can be washed with jeans bought recently? Nothing - the washing of new jeans should be carried out separately from other things, so that nothing faded and spoiled. Turn off the spin completely, and even after washing, try not to squeeze out new jeans. Use a soft detergent for washing delicate fabrics so that your things do not deteriorate. Bought a new thing? How to wash jeans in a washing machine? Set the mode to manual or delicate, and do not forget about the above tips. This is the only way you can keep new clothes in perfect condition. How to dry jeans after washing? To dry, straighten jeans and hang them upright, give the desired shape. Dry clothes in the open air or in a room with well-equipped ventilation. Do not place your pants near heat sources or in direct sunlight. Before you wash your jeans, remember these drying rules, so that immediately after the end of the program, do everything as it should - in a business like washing jeans, literally every minute counts. What if jeans are out of shape and size? Pour hot water into the container and soak jeans in it, hold until the water has cooled. After washing without spinning, dry the jeans at a high temperature, then hang to dry. Re-wash clothing at a temperature of 90 degrees. Caution - possible loss of color. If all else fails, you can take a risk and boil clothes in an enamel saucepan. Be prepared for the fact that after such a procedure, jeans can seriously fade - you have to use paint. Now you are not afraid of such a problem, because you have learned how to wash jeans in a washing machine - you just have to follow these recommendations, so as never to face such a situation. I periodically wash my favorite jeans in a typewriter, in a special pouch and delicate mode, the jeans look like new.